This is legacy information with respect to installing Altium Designer 13, 12, or 10. For the latest information available regarding installation of Altium Designer 14, see System Installation, Licensing & Management. Installation of any software application should be straightforward, intuitive and, perhaps above all, fast – you don't want to be hanging around while an installation progress bar clicks across at a rate of one 'segment' per minute (or more)! Furthermore, when you have that software installed, you want to be able to update it as and when you deem necessary, and in a streamlined fashion. You certainly don't want to have to install from scratch again. Altium Designer provides a fast, efficient Installation and Content Management System that caters for this very need – a system that not only expedites the initial installation process, but lets you handcraft the features available to that software at any time after installation. Altium Designer 13.0 is released as a separate full installation with unique default installation paths. It can therefore be installed side-by-side with an installation of Altium Designer 10/12 (the last update of which was Update 24, Platform Version 10.1377.27009). As it is a separate installation, you cannot update from an installation of Altium Designer 10/12 to Altium Designer 13.0. 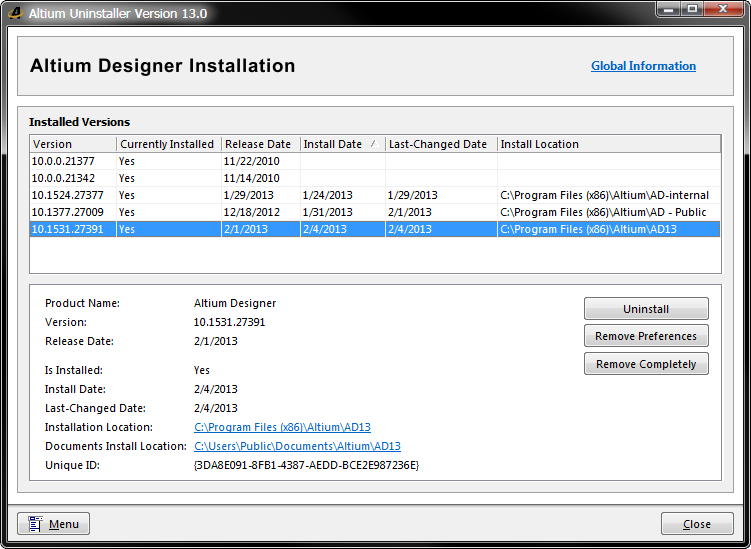 Initial installation of Altium Designer is performed using the Altium Platform Installer. This wizard-based installer is accessed by running a small (less than 10MB) executable – AltiumInstaller.exe. This executable is downloaded from the Software page of the AltiumLive community site, and can be saved anywhere on your hard disk. Streamlined installation courtesy of the Altium Platform Installer. Platform Revision – connecting to Altium's cloud-based platform repository, you will be presented with a list of platform revisions of Altium Designer that can be installed. Simply choose the base platform of Altium Designer as required. Design Functionality – allowing you to specify which features are installed initially. So whether you are concerned only with PCB Design, or Soft Design, or both, now is your chance to tailor the install (albeit at a coarse level) to suit your needs. This will also have an impact on the initial installation time too! Install Location – allowing you to specify the destination folders for the install, in terms of both the Program Files and Shared Documents install locations. These locations become especially important when installing multiple different platform revisions of Altium Designer. The installation itself is streamlined and expedient. The reason for this being that only a base install of the software is performed, in conjunction with chosen initial features. This allows you to get installed, and up-and-running in the quickest time possible. Once installed, you can further refine your installation, in terms of available features and functionality, from within Altium Designer itself. Standalone – client-side license acquisition is managed by the user themself through use of a licensing file (*.alf). This file can be saved, copied and backed-up as required. The .alf file is reusable on a home computer (in accordance with the EULA) simply by copying the file to a specific folder on that computer and then adding the file as part of Standalone License Configuration. License configuration and selection is performed from Altium Designer's My Account page (DXP » My Account). This is 'command central' for obtaining a license. Sign-in to your Altium account and view and select On-Demand licenses available to you. Add a Standalone license file. Or, connect to your Private License Server and use a seat from any of the associated Private Server licenses made available to you by your network administrator. Post-installation management is performed from within the dedicated Plugins & Updates view – one of several views available under Altium Designer's Home page. Access from the Admin view of the Home page, or directly using the DXP » Plugins and Updates command. 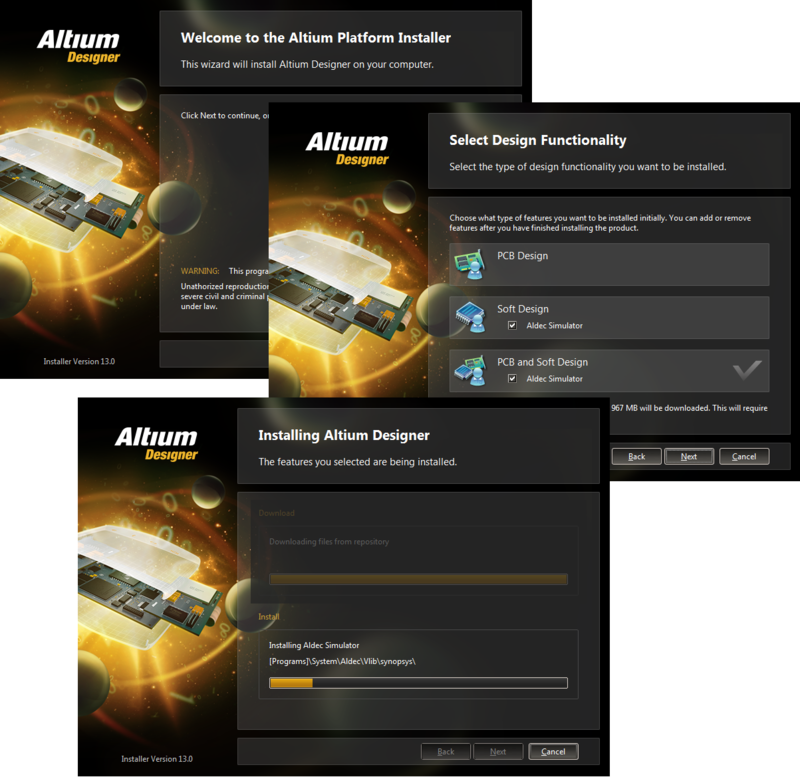 This view presents information about the installation including which revision of the Altium Designer platform is installed, how many plugins are installed and whether there are any updates, including a later revision of the platform. The Plugins & Updates view - command central from which to efficiently manage the optional functionality available to the software. Now, the term Plugin was mentioned briefly, and this is a key concept of the system to understand. A plugin itself is simply a set of files and/or folders to be installed. A core set of plugins are installed and handled transparently as part of the initial install, referred to as System Plugins. In addition, a wide range of Optional Plugins are available – cloud-sourced packets of functionality that are optionally installed or removed by the user as required. It is the plugin concept that enables the installation to be handcrafted in accordance with design needs. Functionality is added to, or removed from Altium Designer, through installation or removal of optional plugins. Customization of an Altium Designer installation essentially boils down to management of the available plugins. Install, update, or remove available plugins as and when you need to. The ability to customize the feature-set of Altium Designer after initial install presents a natural and exciting possibility – the possibility for Altium to present additional features/functionality, in the form of additional plugins, at ANYTIME in the future. Imagine being able to get a new importer, or new FPGA family device support, or add a new Supplier for use when specifying real-world components – as soon as the feature becomes available. No waiting for an official service pack to be prepared. No waiting for features to come in a major release. Altium is able to make that functionality available to you as a series of new plugins in a far more expedient timeframe, providing a cloud-based content stream as it were. A couple of clicks and your installation of Altium Designer is empowered by the new plugin content, with the requested features added to your design arsenal and ready at your disposal – a surefire productivity-enhancer if ever there was one! So just how can you tap into this stream of new content? How can you ensure that you have the latest plugins as and when available? The answer to this is simple – Altium Subscription. A good analogy for Altium Subscription could be a train journey. Subscription gets you on-board the train, your fare if you will. The train moves forward and calls at new destination stations along the way. At each station, there is opportunity to take on board a new destination souvenir (a plugin). If you stay on the train (continue to subscribe) you will enjoy visiting a wealth of new destinations as the train moves ever forward in its journey. If you cease subscription, you will have only those souvenirs (plugins) you have so far collected, but will miss getting to see new and exciting destinations and souvenirs thereof as you must alight from the train. Of course, you can always hop back on and re-subscribe, but by staying subscribed you will always have access to the very latest content – and as soon as it is cleared for release from the developers! A range of designs are available that showcase functionality both in the PCB design and Soft design domains, as well as a full complement of designs relating to the hardware available from Altium – including NanoBoards, Daughter Boards, and Peripheral Boards. These can be downloaded from the Reference Designs section of the Content Store. In addition, the NanoBoard Example Designs section of the Store offers a wide variety of example projects targeted to use of Altium's NanoBoards. Components are delivered through the Altium Vault – vault-based components – and accessed for placement during design-time via Altium Designer's Vaults panel. Vault-based components deliver another level of unification – not only do they include all models, they also include up-to-date supply chain information. In fact, this spanning of the design and supply chain worlds empowers the components to become truly Unified Components. For the latest information on what components are available, including descriptions of all device families, check out the Unified Components section of the Content Store. As well as access to the vault-based components, you can also download an up-to-date Integrated Library of each available component family. Just look for the link on the left when you're reading about a component family. Legacy component libraries and reference designs, built at the launch of Altium Designer 10, can be found on the Download Libraries and Download Examples and Reference Designs pages in this Wiki. Bear in mind that these are legacy and not updated. To ensure the latest offerings, it is advised to source components and reference designs from the Content Store. The Installation Management System supports the concurrent installation of different platform revisions of Altium Designer. The beauty of installing different platform revisions is that it enables you to quickly access a previous revision directly, and independently, whereas an upgrade to the platform revision effectively replaces the earlier revision with the later one. The ability to specify different destination folders during the initial install, in terms of both the Program Files and Shared Documents install locations. The system's use of a Globally Unique Identifier (GUID) for each independent platform revision install. This identifier – which uses the standard 128-bit URN model and is displayed as a 32-character hexadecimal number – is used to uniquely distinguish the application data folders, as well as entries in the registry. When you run a particular platform revision instance of Altium Designer, the system handles, through use of this identifier, only those files and registry entries specific to that platform revision. The default location for the local cache – the folder in which all downloaded files from the nominated installation repository will be stored – is \ProgramData\Altium\Altium Repository. If installing multiple different platform revisions of Altium Designer, it is a good idea to create a unique local cache location for each install, so that a single cache is not servicing multiple installations. For the main program installation and shared documents folders, you have the ability to give those folders meaningful names, which can come in very handy for a machine containing multiple different platform revisions of the software. But for other folders, they are only distinguished by their GUID. Being able to tell you have a folder for the right platform revision suddenly becomes more difficult. 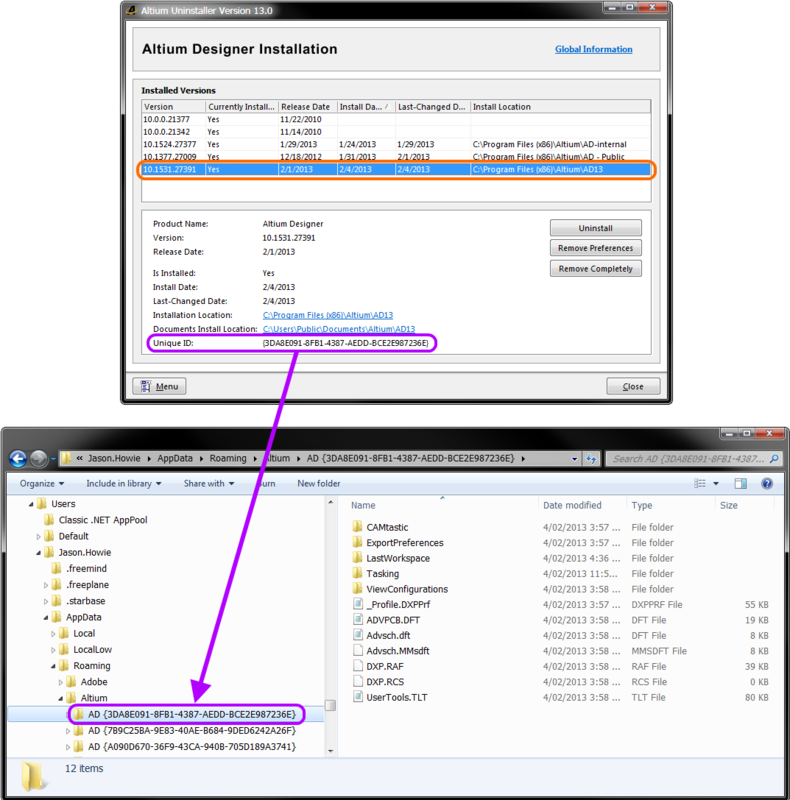 But through the Altium Uninstaller (see Uninstalling), you can quickly identify the GUID used for a particular platform revision installation and, armed with that knowledge, can pick the right folder through Windows Explorer. Using the Altium Uninstaller to identify the GUID for a particular platform revision of Altium Designer. After installing and launching a new platform revision of Altium Designer, the designer is given the opportunity to import preferences from the most recent previous installation at startup. Not only will the preferences be imported, but the user settings will be copied across too –- ensuring the new revision opens with the same look and feel created in the previous revision, even down to the last opened workspace and panel positioning! If the option to import preferences on initial startup is not taken, don't worry – preferences can be quickly imported, at any time, from within the Preferences dialog. Simply click the button, at the bottom of the dialog. The associated menu will list all previous platform revisions/releases currently installed on the computer, and that can be imported from. Preferences can be imported from any individually installed platform revision of Altium Designer (AD10 and later), or any of the following previous major releases of the software: Summer 09, Winter 09, Summer 08, and Altium Designer 6. Uninstalling Altium Designer is performed using the Altium Uninstaller. This is a dialog-based utility, accessed by running a small executable – AltiumUninstaller.exe. This executable is downloaded from the Software page of the AltiumLive community site, and is typically saved to the same location as AltiumInstaller.exe. Uninstalling the software is streamlined, courtesy of the Altium Uninstaller. The dialog consists of two pages – switch to the non-active page using the relevant link in the upper region. The first page, Altium Designer Installation, provides a listing of all detected installations of Altium Designer (AD10 and later) on the PC. Key information is provided in the upper region, including version, whether it is installed or not, and the main install location (where the DXP.exe file is located). Uninstall – removes the install folders (program files and shared documents locations) but leaves preferences-based folders alone. This enables you to have a build that is not currently installed, but whose preferences can still be reused, for example by importing into another installed platform revision. Repository Builds Cache – located at \ProgramData\Altium\Altium Repository (Windows 7) or \Documents and Settings\All Users\Application Data\Altium\Altium Repository (Windows XP). 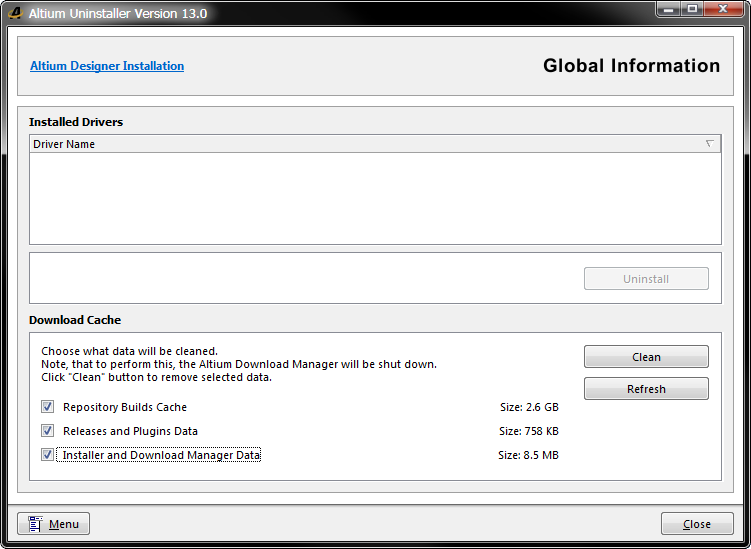 Installer And Download Manager Data – located at \ProgramData\Altium\AltiumDownloadManager (Windows 7) or \Documents and Settings\All Users\Application Data\Altium\AltiumDownloadManager (Windows XP). The Altium Uninstaller provides controls to clean downloaded data as part of an uninstall regime. To fully remove a default installation of Altium Designer from the computer, first clean the downloaded data (with all options selected), then select the installation and click Remove Completely.